PESA, a U.S.-based custom design and build manufacturing company for professional audio and video signal distribution, revealed that Georgia Tech Online (formerly Distance Learning) is using a new PESA Cheetah 288XE digital video router at its Global Learning Center in Atlanta as part of its migration to HD production for its online professional education coursework. The new PESA router was installed in late December, and the Center is currently migrating to the new system. Built in the heart of Georgia Tech’s Technology Square, the Center is the university’s main hub for online education, including professional and non-credit courses. When the building opened about 10 years ago, a PESA Tiger 144x144 router was installed to handle AV sources throughout the Center for recording to DVD. Eventually, a second router was installed to handle computer-based rich media capture. According to Steve Allen, senior AV/IT support professional, working with two routers has been a “logistical nightmare,” because each router works from a separate, incompatible scheduling device. The new PESA Cheetah 288XE will eliminate the need for two routers and simplify scheduling. “I can handle it all in one router—and not worry about two routers or two different parallel paths,” Allen added. er maintains a “codec farm.” All signal— including audio, video, and high-resolution computer-based content—are routed to a bank of capture stations that serve the entire facility. Not only does this create redundancy, Allen noted, but it saves on equipment costs. The Center is using Cattrax web, PESA’s web browser-based control software, for monitoring and controlling its new Cheetah router. Allen said the user interface makes it easy to route resources on the fly, and the flexibility in naming sources (beyond the eight character limit of earlier routers) is helpful. He also uses the system’s unique password protected user profiles to restrict some users from accessing certain I/Os. Three of the facility’s 16 studio classrooms have already been converted to HD, and plans are in place to convert a fourth room. 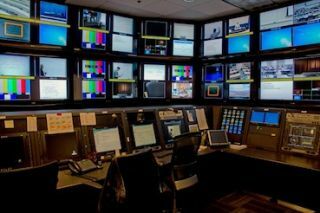 Room upgrades include cameras, switchers, matrix switchers, and fiber connectivity, as well as PESA Vidblox extenders and QuadBlox units that are used to transport AV and rich media content back to the new Cheetah router. Allen said the Center’s transition to HD production is a slow process, as classes remain in session and classrooms cannot be shut down for an extended period of time.